Veteran Bill Sterrett will tell you this if you spend a few minutes with him, and he knows from very recent experience. Sterrett, a 2015 Our Family Services client, was honored to receive a newly refurbished car in November as part of The Progressive Group of Insurance Companies’ Keys to Progress program. Tucson Service Center Manager, David Sowers, says Keys to Progress is Progressive’s effort to “give back to those who’ve given a lot for this country.” Sterrett and another former Our Family client were the first Tucson veterans to receive cars after Progressive opened its local service center last year. Sowers, who is also a veteran, says Keys to Progress takes the work of many parties, such as mechanics, parts suppliers, the National Auto Body Council, and others who enjoy helping veterans in need. Sterrett says the car he received, a 2010 Chevy Malibu, is “definitely a blessing to us. It’s still amazing to me every time I get in the car. I’m still shaking. I’ve never owned anything this nice before.” Previously, Sterrett drove an unreliable 1969 Volkswagon Bug with “paper-thin” brakes. Sterrett and his family are a perfect example of how the Family Stability Project (which Our Family operates in partnership with United Way of Tucson and Southern Arizona and the Siemer Institute for Family Stability) helps families in financial crisis get back on their feet. When the Sterretts came to Our Family last February, they faced eviction because they were behind on their rent. They had moved to Tucson only a few months earlier, and Sterrett had not yet found full-time employment. Working only three shifts a week at a fast-food restaurant, Sterrett’s paychecks barely covered rent, let alone other necessities. It was a position Sterrett had never been in before; he is usually the one lending a helping hand. 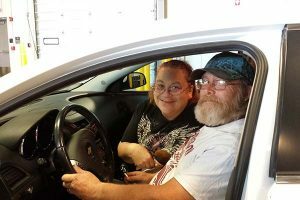 In fact, when he received the car in November, Sterrett and his wife had two young people living with them, one of whom would have otherwise been homeless, in addition to their grandson, whom they adopted at age two and have raised as their own. Our Family case worker, Sharlene Gatison, was able to help the family catch up on their unpaid rent and obtain food, toiletries, and a uniform and job training for Sterrett. Gatison says Sterrett “went above and beyond” the program requirements. By last fall, he had been hired by the Tucson Unified School District as a full-time bus driver.